A two part post…trying to catch up! The journey to Vang Vieng from Luang Prabang begins with a groggy stumble to the local french restaurant, and after a great cup of Americano and an omelet climbing into the back of a tuk-tuk to the South Bus Station, arriving at 7:50am. The stars seem to align and there is room on the 8am VIP bus to Vang Vieng. VIP doesn’t really mean much other then Air Conditioning and non-vinyl seats, but it is glorious. We begin our trip and are heading up into the hills in almost no time. We are following the river, and as we climb, the houses get further and further apart and the banks of the river become consumed by well tended, lush crops in varying shades of green. The road seems to increase in windy-ness and decrease in width as we go. 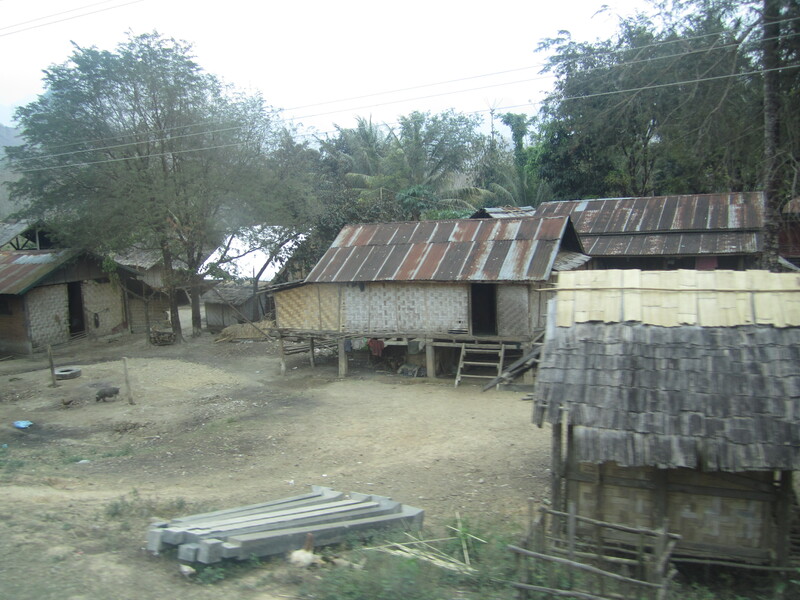 We slowly make our way through tiny villages, with houses constructed of woven bamboo and palm up on stilts with small children either running around naked or with only t-shirts on (I suppose this cuts down on the need for diaper changing). As we continue to wind our way up the hills, I am surprised to find that the smoke gets thicker and thicker. It seems that this is the burning season, which means that the farmers are preparing their fields for the rainy season by burning them. I’m getting pretty sleepy at this point and nod off for a bit. When I wake up, I see that we are stopped at the top of a hill beside a small group of women and children selling fruit, veg and some other bits and pieces. One of the guys from our bus jumps out and chats with the ladies for a bit. 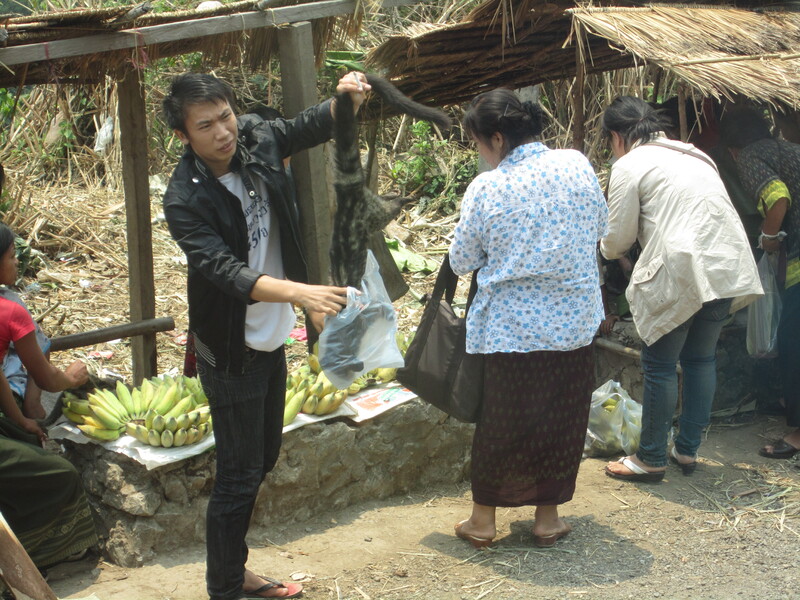 He then holds up some sort of dead furry predator animal to get his friends approval before buying it. I snap a picture as I have never seen anything quite like this before. We then set out again and find the winding reaches the critical point when the retching begins. Luckily, there is a toilet on board. Unluckily, I am sitting at the passage to it. So, I crank up my ipod and decide to revisit my old love, Pennywise. This brings me back to my punk loving days and some really awesome memories flood me with nostalgia. I enjoy my stroll down memory lane, but am snapped back to reality when the scenery becomes so dramatic and impressive that it consumes all of my attention. The mountains seem to jut straight up to the sky in sharp peaks and drastic valleys. 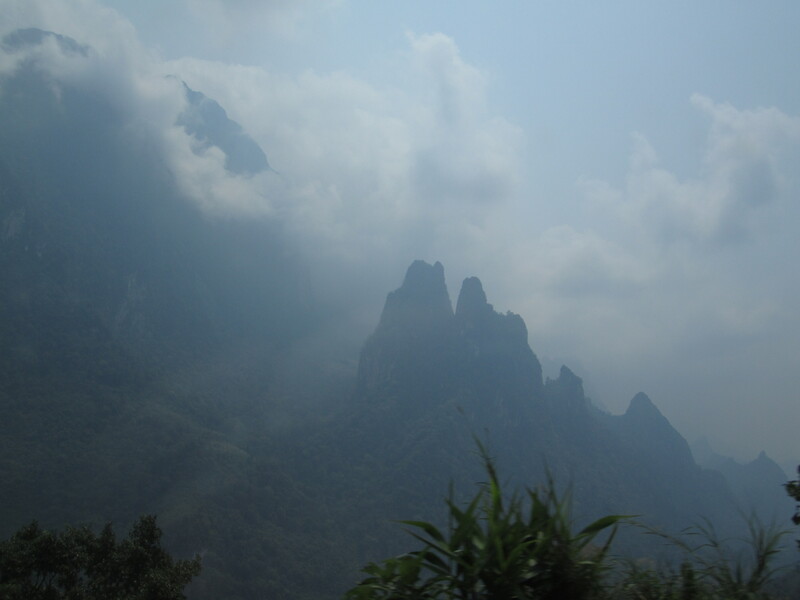 Along the mountainside, sheer limestone rock faces pop out from the lush jungle surrounding them. And this is the dry season. I can’t imagine how incredible it must look after a big rain. Off to the other side of the bus I can spy perfectly flat rice paddies stretching out until they encounter the 90 degree face of an enormous rock outcrop, which stretches as high as the bus windows allow me to see. At this point, Eddie Vedder is singing to me in his hypnotic way. The combination of view and Vedder sends me toward total bliss. I cannot fully wrap my head around the fact that I am actually here, living this exact moment. We catch our first view of the infamous tubing river. Welcome to Vang Vieng. We arrived in town just after 3pm and wander around looking for a place to stay. I find a place right in the middle of town, next to the tubing depot and across from the larest of the “Friends” cafes. In Vang Vieng, the cafes seem to play an endless loop of either Friends or Family Guy. It seems ok at first, but hearing the theme song constantly is enough to drive a person mad. My room seems good; one bed, a private bathroom and a hot shower. What more could you ask for at the price of $5/night? The group decides to head out tubing in the morning. Tubing in Vang Vieng is kind of the best and the worst of travel. It is beautiful landscape, with supurb mountain views and stunning jungle. But the banks of the river are lined with bamboo platform bars with rope swings, waterslides, ziplines and enough cheap whiskey buckets to keep a small country drunk for days. I have some trouble getting my head around this. I know that I should be opposed to the impact that this kind of tourism has on the local population, but it is just so much fun! Unfortunately, Cam had hurt himself at the Start Tubing bar (on the rope swing) and he and Tess head home. I was alone for about 1 minute before meeting up with a group of Aussies who shared our tuk-tuk to the river. What amazing luck! We spent the whole day and evening together as well as the next 2 days. We decided to try to do all the ropes and still tube the whole way back to town. The further we got from the 5th or 6th bar, the fewer and fewer the bars and people become and the darker it slowly got. Finally, those of us still left (Justin has floated downstream somewhere) pulled off to a platform with 2 Lao ladies on it and asked for a tuk-tuk. It turns out that we were in the middle of the woods and ended up walking with our tubes through the woods, through some rice paddies, in the dark before getting to an overpriced tuk-tuk. We were so relieved to get back to town! The next day was very slow to begin. I unfortunately lounged about in the Friends cafe for far too long before finding my awesome Aussies again. We hung out and I convinced them to stick around for an extra day and attempt the river again. This time, we decided against tubes, so I brought my camera. It had rained at night and turned the water from clear green to brown like Willy Wonka’s chocolate river. We met up with some Austrian guys and continue to hang out after the river. 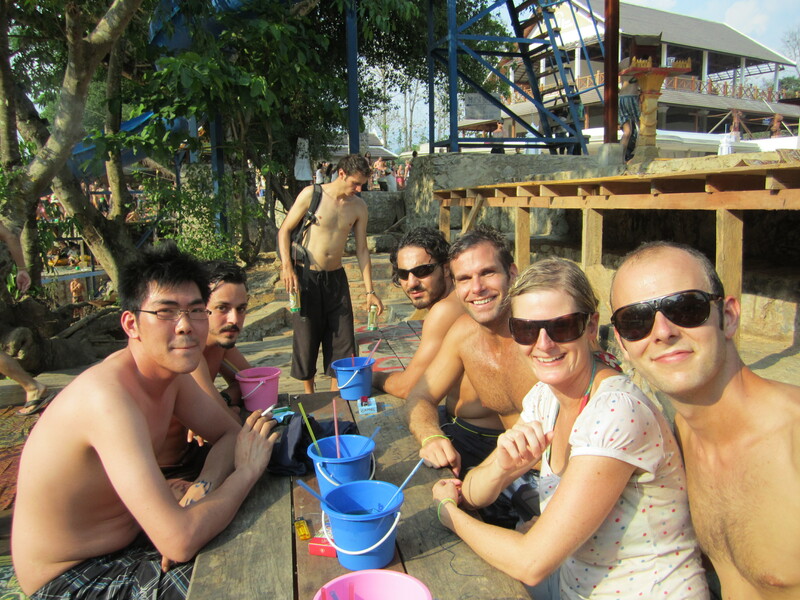 The following day was my last in Vang Vieng. There was one Aussie, one Swiss, one Thai and one of the Austrians left functioning, so we loaded into a tuk-tuk and headed to a nearby limestone cave. The signs all said “Tourist Cave” so I had very low epxectations. We hiked up a hill that was very much like the Grouse Grind before coming to an opening in the side of the mountain. Looking in, there were a few other people there, but they were soon gone and just Jon and I were left. We went deeper and deeper into this enorums cave, finding spots where the ceiling is at least 50m high. We were the only people there with just a few bats to keep us company. It was surreal, and very surprising. What an incredible experience. The next day I arrange my bus to Vientiane, which takes about 4 hours, is packed and has barely functioning A/C. As I was wandering through the streets of the capital city, I heard someone call my name. I thought that I must be hearing things, who could I possibly know in Vientiane? I looked up and saw Tom who had been at the Gibbons with me. 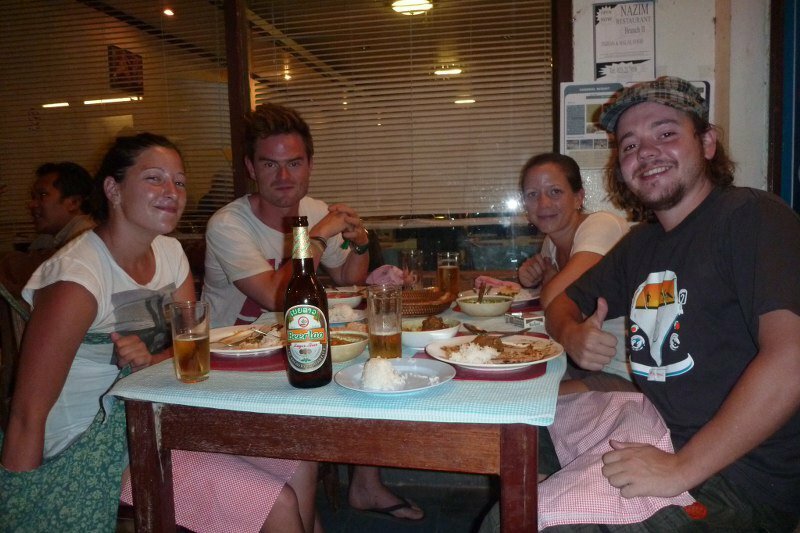 He was meant to be in Thailand, but has ended up back in Laos and is now traveling with a German named Stefan. We all head to the national pool (kind of like swimming in someone’s backyard) and meet Fay, who knew Tom and Stefan from Pai, Thailand. 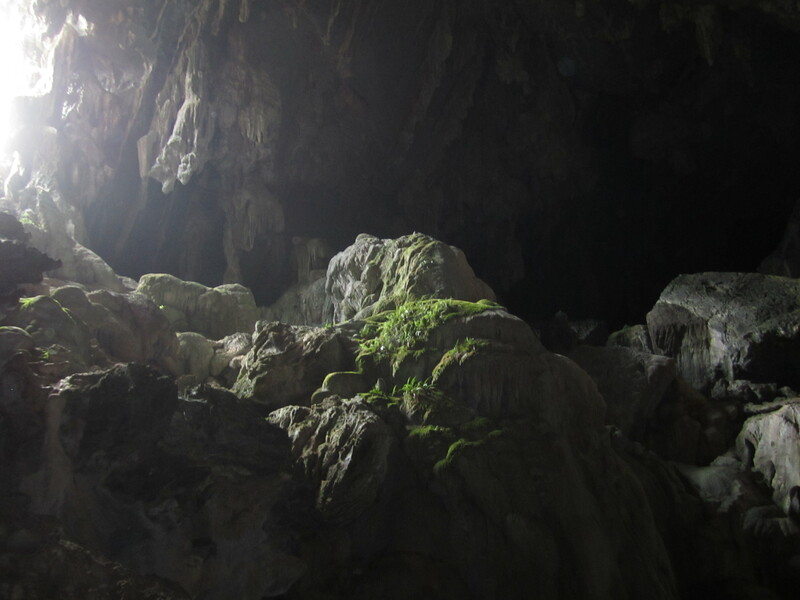 I latched onto this new group and we decided to take a big tour into the center of Laos to get a little off the beaten track and to search for the Kong Lor Cave. Our time in Vientiane came to an end and we were off on the first step in our grand adventure! 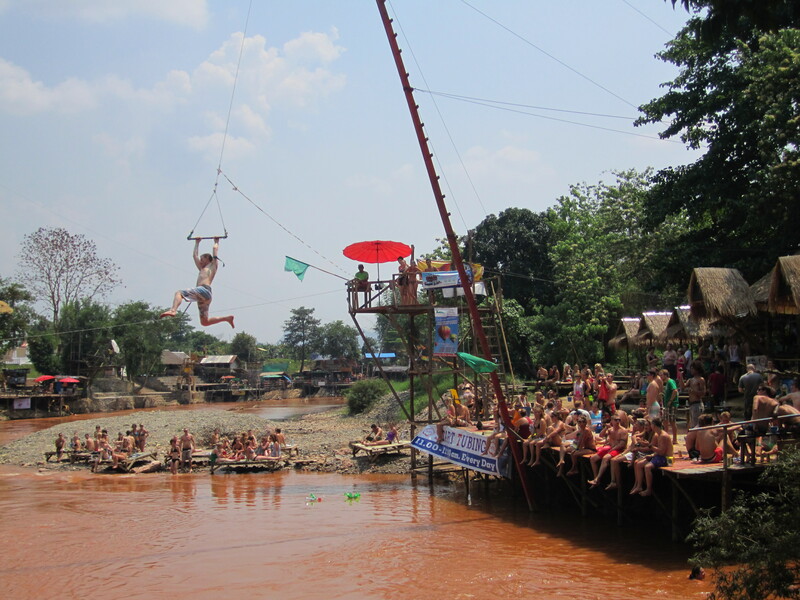 7 Responses to Central Laos: A tube, a cave and a Capital City. I just think it is so funny and so fantastic that no matter where you go you know people! lol! love that! Now quit getting behind in your posting, I need to live vicariously through you!!! You are such a rockstar! I miss you!! sounds like you’re making the most out of your worldly travels. i love reading your (not cheesy) posts and i too love that your meeting up with people you know everywhere and i love your pictures and i agree with katie … you are a rockstar!!! Hiya kerri, rick just gave me the website of your blog and I think its awsome. Hope your having a great time.